Leema Acoustics has been punching well above its weight recently. Initially recognised for its loudspeaker designs, the Welshpool-based company now produces three ranges of electronics to partner them. 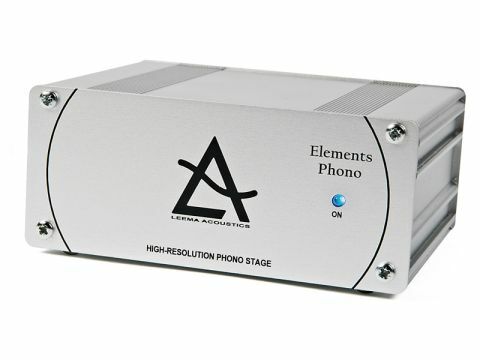 The Elements Phono is the latest arrival and is intended to partner amps in the first two ranges. Leema claims that the Elements Phono borrows heavily from the flagship Agena phono stage, which is no mean feat given that the Agena is nearly six times the price. The Elements phono supports both moving magnet and moving coil cartridges. The specifications suggest that few cartridges of either design will present the Elements with any real difficulty. The single input is changed via a push switch on the rear panel. Additionally, there is a low frequency filter activated by another push switch. This only functions below 20Hz with the intention of reducing noise from warped records or turntable motor noise. Power is supplied from an external 24-volt unit. Phono stages are often rather smaller than other components but even with this proviso, the Elements must be considered truly tiny. It is a rare occasion when the long-suffering Hi-Fi Choice logistics manager is given the option of shipping a product in a jiffy bag. At slightly over ten centimetres wide and less than five centimetres tall, the Elements is nothing if not easy to accommodate. The small casework is beautifully finished though and the small rubber feet provide enough grip to ensure the Elements will not be moved around by the cables being attached to the back, unless you attempt to connect something with the dimensions of a hosepipe. A very minor gripe is that the Elements is sufficiently small that the wires connected to the rear panel are hard to hide away with any degree of finesse. Listening was initially conducted with a Dynavector DV20X moving coil cartridge. This has a relatively low output of 0.3mv and can provide a challenge for some phono stages to provide sufficient gain. The Elements was able to easily provide levels sufficient for all but the most ballistic of listening and did so, whilst at the same time providing low levels of background noise. At no stage in listening did we have any appreciable problems with hum, despite placing the Elements in a number of increasingly unsuitable locations. At this price point we do not see too many Elements being used with moving magnet cartridges, but switching to a Clearaudio Virtuoso for some listening showed that the Elements has similar behaviour with both cartridge types. The Elements is beautifully controlled and cohesive in use. The hugely entertaining musical score to Brother on the Run is reproduced with a fine soundstage and an openness that allows the slightly murky nature of its recording in the early 70s to be easily understood without losing any of its charm. The presentation is upbeat and lively without tipping over into unwelcome forwardness with bright recordings. Tonality, especially with individual instruments, is good and vocals were never less than well presented on anything we listened to. Surface noise, even on older vinyl, was well contained and rarely intrusive. The Elements is happiest with recordings that allow it to show off this tonality and detail. Combinations of instruments and vocals up to and including full scale orchestral works were always presented with the same aplomb. Switching to more stark electronic offerings such as Boards of Canada's The Campfire Headphase saw it become slightly more congested and less assured, but still able to convey the punch and drive within the recording. The only real area where the Elements is ever less than excellent, is in the reproduction of very deep bass. Listening to Kraftwerk's Minimum Maximum live performances, there was a sense that the very lowest notes were being reined in slightly. The Elements is a very talented and welcome addition to this competitive part of the market. The specification, performance, and build quality are all extremely impressive. Judged by the toughest standards it is not a complete all rounder, but it is an essential audition at this price point.